This is the shelter for unaccompanied immigrant children on North Oracle Road near West Drachman Street. The Tucson shelter for unaccompanied migrant minors is almost full as the number of children and teens making the journey north rises. About 5,000 minors were apprehended along the Southwest border during the first month of the fiscal year, almost twice as many as this time last year, Customs and Border Protection data show. The Office of Refugee Resettlement, charged with the care of the minors, offered a rare glimpse of the Tucson facility this week to a small group of community stakeholders and an Arizona Daily Star reporter. The purpose of the visit was education, said Tucson City Councilman Steve Kozachik, who requested the tour and the inclusion of the media. He was concerned about the children’s well-being following reports of several teens who fled in October. “The goal is their reintegration into a safe space and they are doing that,” he said after talking with shelter and government officials. The shelter opened in the summer of 2014 in response to an increase in the number of Central American children and teens traveling without a parent or legal guardian who were turning themselves in to the Border Patrol. Last fiscal year, there were nearly 70,000 unaccompanied minors apprehended along the Southwest border — 50,000 of them in the Rio Grande Valley in Texas. Many are fleeing gangs and violence to seek relief here — El Salvador, Honduras and Guatemala have some of the highest homicide rates in the world. Others come to reunite with parents already here. Casa Alitas, a program from Catholic Community Services, has also seen an increase in the number of families the government releases while their cases are pending. It had received about two families a week since summer, volunteers said, when the government started to send many of them to Phoenix to get a monitoring ankle bracelet. Recently it’s been a steady 10 to 12 families from a wide range of countries. “We are seeing a lot of sexual assault against women, families escaping gang recruitment,” said Jamie Flynn, AmeriCorps VISTA in-house volunteer. A Salvadoran mother was fleeing because her 9-year-old son was being recruited by gangs, and she said she was sexually assaulted. The Southwest Key shelter houses 265 children and has a capacity for 283. This week, Southwest Key, a nonprofit based in Austin, Texas, held a job fair to bring staffing levels to 350 to meet the demands of caring for the increasing number of minors and younger children who require more attention. Nationwide, 27 percent of the minors are under age 14, up from 17 percent in 2012. After the Border Patrol apprehends an unaccompanied minor, agents have 72 hours to turn him or her over to the Office of Refugee Resettlement, which then places the minor in one of dozens of shelters, mostly along the border. Southwest Key describes itself as the largest provider of shelter services to unaccompanied minors in the country. It also operates two shelters in Phoenix, one in Glendale and one in Youngtown. Children stay inside the shelter as they await being set up with a sponsor, either a parent or relative, who takes them in while their immigration case proceeds. 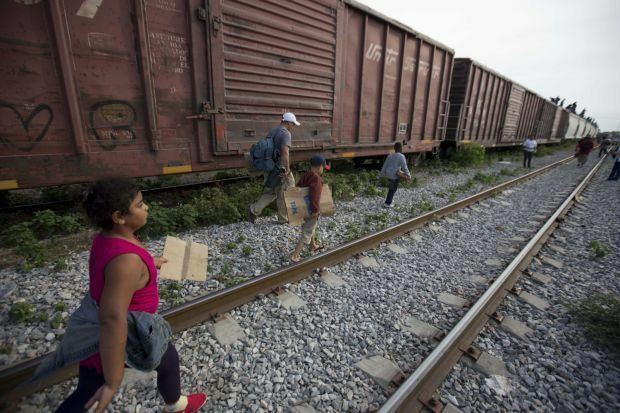 The goal of the program, ORR officials said, is to reunite children safely and swiftly. Before children are turned over to a sponsor, they have to provide fingerprints, go through background checks, proof of address and in some cases home studies. Care providers also have to do a “safety and well-being follow-up call” with the minor and the sponsor 30 days after reunification to make sure the child is still living there, enrolled or attending school, is aware of upcoming court dates and is safe. But while the child is waiting to be reunited, Southwest Key staffers said they want to make sure the children feel welcomed and that they have fun. As they arrive at the converted off-campus college housing, they are welcomed by two wall-size murals with children holding hands around a globe and inspirational words in Spanish, including bravery and integrity. The hallways to the medical clinic and intake area where they first arrive are lined with characters from El Chavo del Ocho, a popular Mexican sitcom. Each dorm room has a twin bed and bathroom. A stove and a television from student housing days aren’t plugged in. For young mothers, the shelter provides a crib and child care while they are in class. While they wait for reunification, children take classes in subjects including English, math, social studies and PE. The former ballroom and gym are classrooms, with walls covered in maps and the children’s drawings of their home countries’ flags and national birds. What used to be a coffee shop is a game room with pool tables and foosball tables. At the cafeteria entrance is a big white board with a calendar listing different activities for the month, which include movie night, religious services and council meetings, and where children they make requests to the staff — often for hair gel to look good at one of the regular dances —, and provide feedback on the food. Younger children have storytelling time in a new dorm-turned-library — complete with donated books, activity sets and colorful mats — which resembles a kindergarten classroom. The apartments have a large courtyard and a pool. Per company regulations, the kids are not allowed to use the pool, but they have plenty of grass for soccer. Children from other Southwest Key-run facilities join them on some weekends to hold tournaments, workers said. There also is a basketball and volleyball court. Due to current numbers, the children are broken into groups to eat their three meals in the cafeteria. One day this week, the large room was filled with the smell of chicken and rice. The staff also makes snacks and water available throughout the day. “I had kind of worried before seeing the facility that it might feel a lot more like a facility or almost being detained, but it’s really homey,” Flynn said. The heart of the staff is what most impressed Kozachik. “The fact is these are their kids, they are taking ownership of the kids’ safety,” he said. Three teens walked away from the North Oracle Road facility. The ACLU says DHS has failed to produce documents related to alleged abuse of migrant children in custody. In stark contrast, most kids five years ago traveled with a parent. Children without legal documents coming through ports of entry in Tucson area up. Southwest Key has openings for 200-plus workers there. The president's budget request for fiscal year 2016 includes $948 million in funding for the unaccompanied children's program. As more cross border, U.S. deports those already here. Federal government will have to show thorough background check if state is to cooperate.